Msgr. 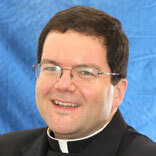 Michael K. Magee is a faculty member at St. Charles Borromeo Seminary in Wynnewood. In a certain sense, there seem to be two distinct “universes” at issue here: the world of material things that we can see with our eyes, and the world of spiritual realities and beings that we can ascertain by reason but cannot perceive through our senses. These would in fact seem to be entirely separate “worlds” if not for the fact that they coincide in our own human nature, composed of a material body and a spiritual soul. The sad experience of attending the funeral of a loved one brings home to us the vivid reality of the spiritual soul: it is the presence of the spiritual soul that accounts for the difference between a live body and a dead one. It is in the bodily realm that we experience physical light and darkness, heat and cold, tenderness and coarseness, hunger and satisfaction, thirst and refreshment. But it is in our spiritual dimension that we encounter knowledge, willing and loving. Upon reflection, it becomes obvious to us that the spiritual world comprises the nobler part of the created universe. Material things fade and decay, while spiritual realities and beings simply do not possess any parts that could break or decompose. Man’s spiritual soul is therefore immortal by nature, while his body is destined to share in the soul’s immortality through the gift of the resurrection. We are created beings composed of both matter and spirit, and we encounter other created things that are purely material. God, on the other hand, is purely spiritual. It is not surprising, therefore, that the “chain of being” should also be completed by the existence of created beings who are purely spiritual: able to know, to will and to love, but not conjoined as we are to a physical body. We are told that there are very many such beings in God’s creation, but there are a few of them that Sacred Scripture denotes by names that have become familiar to us, such as Michael, Gabriel and Raphael. Invisible to us in their own nature, they have sometimes assumed visible forms in order that human beings might be made aware of their presence, action and communication. As we encounter them in Sacred Scripture, angels are quite devoted to God’s plan in history, and it is Catholic teaching that each of our individual lives is visited and protected by one of them for this reason. The notion of a “Guardian Angel” for each of us, then, is not merely a cute consolation for children afraid of the dark, but a truth of faith for every one of us as we are accompanied through life’s material and spiritual dangers by a created being who loves us precisely because God Himself cares about our welfare. Finally, just as we possess the freedom to follow God and grow in His love and the alternative capacity to reject Him, angels too have already been subjected to such a “test,” and there are some who have definitively rejected God. His love for them continues to hold them in existence, but their rejection of Him renders them evil. In terms of their created nature they are similar to the angels, but their refusal of His love and persistence in evil accounts for their designation as “the devil” and “demons.” Unlike human beings in the present life, such beings have destroyed their own freedom and can no longer repent, so that they are eternally lost. For a certain time, God has allowed them even to exercise a limited influence in the world, pursuing evil intentions and seeking to induce human beings to make a choice against God similar to their own. But the cross of Jesus Christ has meant the ultimate end of the devil’s attempt at sovereignty in the world. Because the devil and his demons are mere creatures completely subject to God’s power, their defeat is certain, and human beings who turn from sin and choose God, believing in His word and receiving the sacraments that He gives them, have nothing further to fear from this realm of evil. PREVIOUS: Children at Mass – no sweat! NEXT: What will you wear to church?